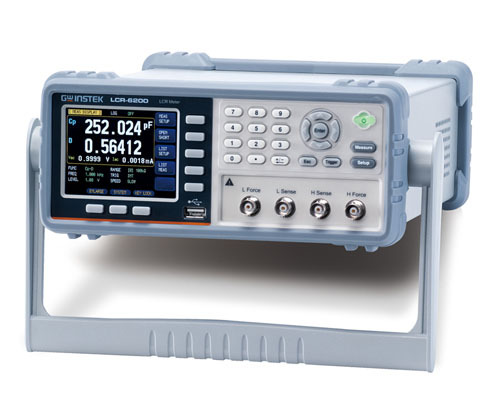 The LCR-6000 series, within the provided frequency range, features consecutive and adjustable frequency capability which allows users to conduct measurement and analysis on components with the most genuine frequency requirements. For OPEN/SHORT fixture compensation function, the LCR-6000 series is equipped with full frequency range zero and spot zero selections. After executing full frequency range zero, users, under the conditions of not turning off the power and not changing test fixture, can freely change test frequency for the LCR-6000 series to execute component measurements that tremendously saves time in repeatedly zeroing test fixture after changing frequency. The measurement result display of the LCR-6000 series not only reveals primary and secondary measurement parameters but also includes two monitoring parameters. Therefore, four DUT related parameters can be simultaneously shown on the display screen to save time if repeated measurements are required. With respect to display screen, the LCR-6000 series features diverse display to meet users’ observation requirements. For instance, MEAS display shows setting parameters and measurement results at the same time; ENLARGE display focuses on measurement results and PASS/FAIL judgment is available, which is conducive to assist engineers to swiftly obtain the validity of measurement results. The LCR-6000 series provides the 10 points listed test function, which allows users to define a set of DUT measurement parameters (such as Cs- Rs) and to set 10 test criteria of category (either by frequency or by voltage or by current) but different values to conduct measurements. Through this function, users can rapidly and clearly obtain DUT’s characteristic variation trend to determine the adaptability of DUT’s practical applications. The measurement results can be recorded directly in the internal memory and be transferred to the PC through USB. 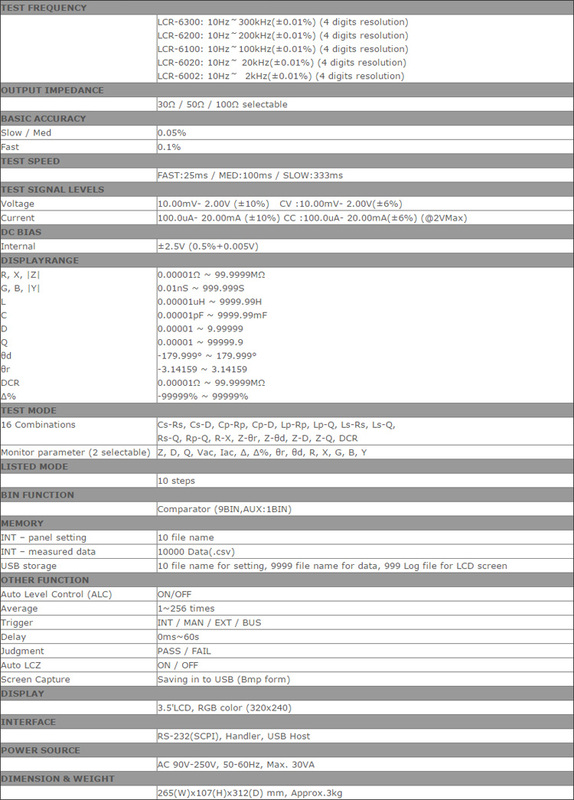 The LCR-6000 series also provides free PC software (maximum 1,000 points listed tests) in order to satisfy users’ analytical requirements on delicate variation. To satisfy the diverse measurement application requirements for different components and materials, the LCR-6000 series collocates with many auxiliary measurement functions. For capacitor measurement, Automatic Level Control (ALC) is mainly for component which requires a constant or rated test voltage such as multi-layer ceramic capacitor (MLCC). An internal D.C. bias voltage (±2.5V, internal) is allowing simulating A.C. and D.C. coexistence to learn capacitance variation. For inductor measurement, the D.C. resistance measurement function is to validate D.C. resistance characteristics. Additional, the LCZ function is to quickly identify components ’characteristics. When the function is activated, the LCR-6000 series will automatically determine DUTs’ characteristics and reveal the optimum parameters to show the measurement results. For interface connectivity, the LCR-6000 series comes equipped with handler interface and RS-232C interface. Handler outputs 10 BIN (9BIN, AUX: 1BIN) sorting results that is best for external connection control, for instance, connecting to a sorting machine to conduct components’ sorting operation. RS-232C is suitable for remote control and measurement results retrieval. The PC gives commands to control settings or to read measurement results so as to achieve the requirements of verifying automotive applications.